As Clerkenwell is fast approaching, it’s only appropriate I write my review on Salone de Mobile and Fuorisalone to compare findings and inspiration for the year ahead. The design trip was last minute; a now or never opportunity regarding 2018 so I was grateful to join the wave of people that jet set from every corner of the globe. With the flood of designers, exhibitors and creatives, accommodation was initially a slight struggle with business owners and money makers hitching up prices almost quadruple the price. However, I managed to book an apartment with a beautiful terrace in the Tortorna District of Milan. If your time is limited, I would recommend staying in Tortona as it is one of the more highly concentrated areas of ‘Fuorisalone’ crammed with exhibitions, cafes and events. The Brera district is very similar in this respect too, if not more so. 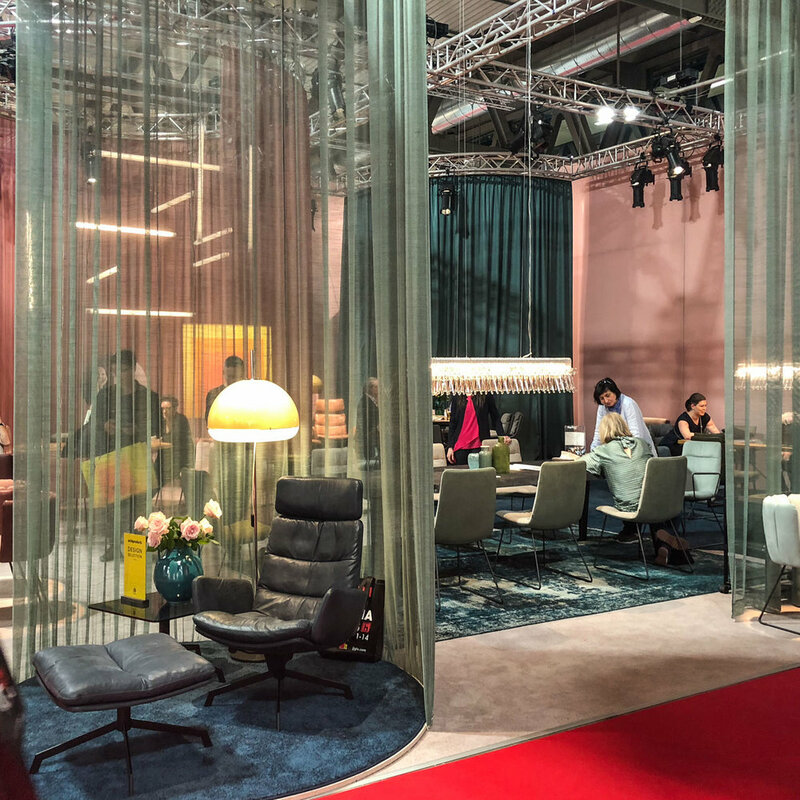 But to really see as much as possible, confirmed as the world’s largest furniture furniture and design fair, Salone del Mobile at Rho Fiera is a must. Although, it’s easy to get lost in the labyrinth of displays and multiple halls, so be sure to make note prior of the exhibitors you’d like to see. From an overall viewpoint, I noticed there was less of a focus placed on new product launches but rather exhibitors making a conscious effort to create memorable experiences, in fact very shareable as well. 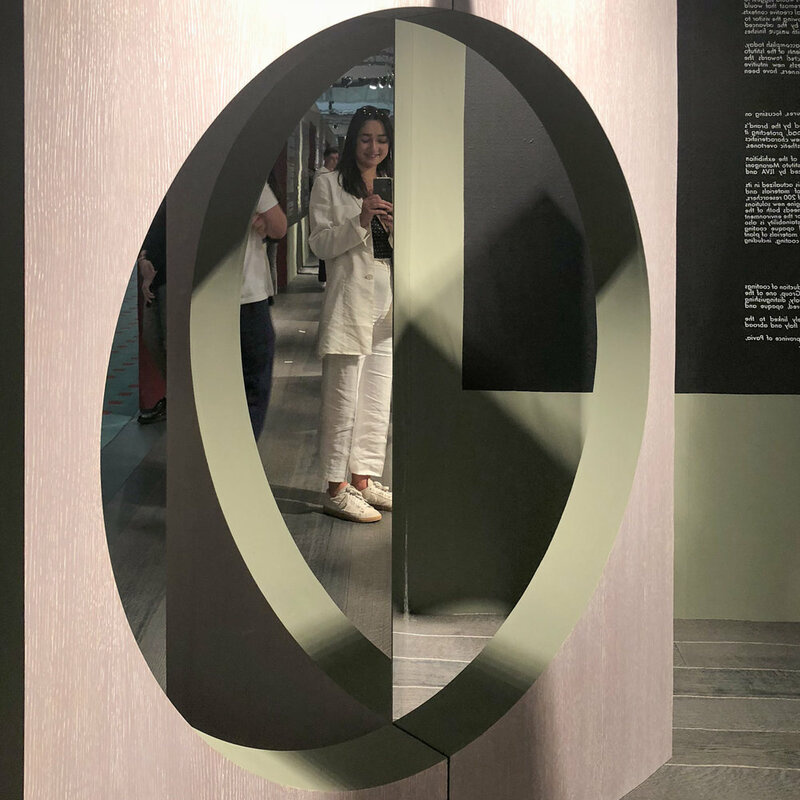 Particularly in the age of the selfie, mirrors and reflective surfaces was a prevalent player performing as a disruption to the spatial realm generating paradoxical type arrangements. COS supported the work of the California-based artist Philip K. Smith to bring ‘Open Sky’ an installation to Palazzo Isimbardi. 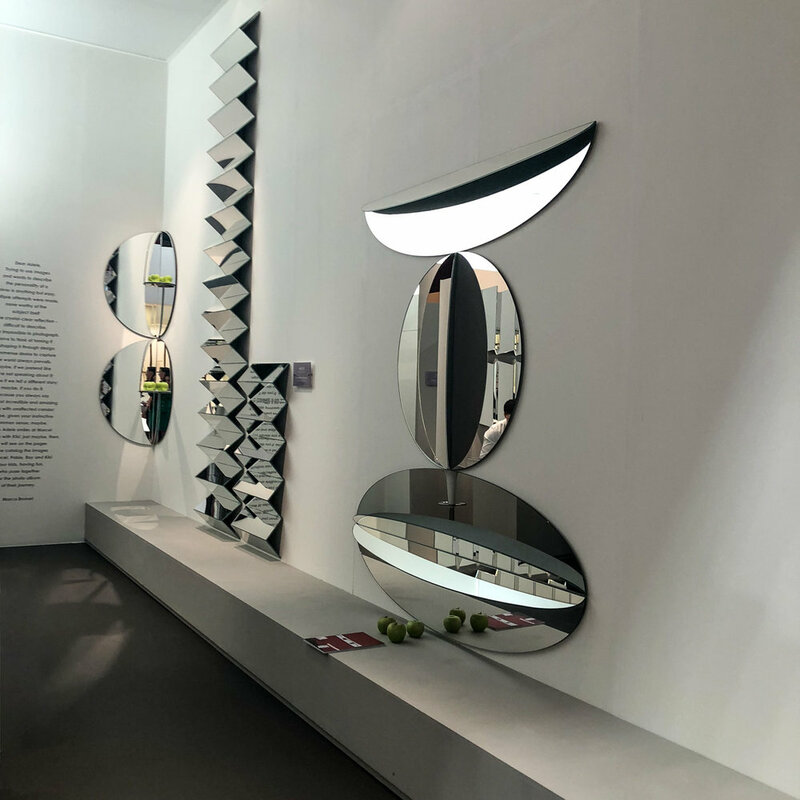 That comprised of a series of mirrored panels each tilted at a 47-degree angle, which respectfully gave a nod to the experience, the architecture and Milan itself. Continuing the theatrical-like illusion, the emergence of larger-than-life translucent and see-through products that act as a divider in any setting, a flexible alternative to facilitates our everchanging needs and wants. One of the most magical experiences was visiting HAY at Palazzo Clerici, the location oozed with historical features poetically juxtaposed with a series of installation that conveyed examples of past and future living scenarios; with a human-centric approach to interior design, rather than focusing on the structure. The Rayures modular screen in fluted glass for Glass Italia designed by the Ronan and Erwan Bouroullec was a notable highlight. A recurring expression of drama also took the form of translucent floor to ceiling draperies, which would add a show-stopping, yet fluid and soft tactile feature to any environment. Many pieces of furniture acquired the shape of an exaggerated figure with plumper silhouettes, inflated curves and ballooned proportions. 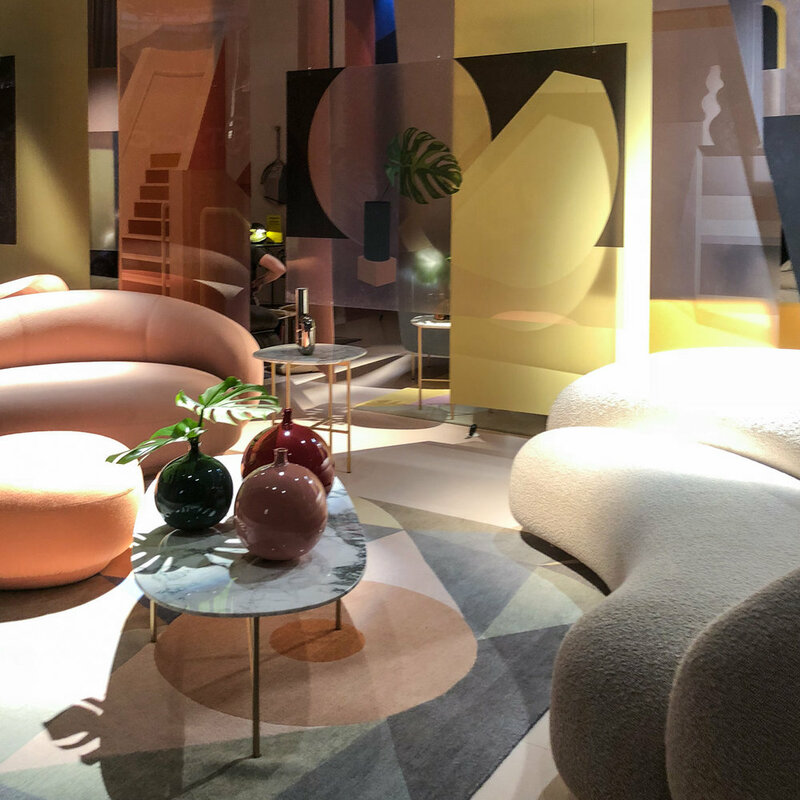 The Tacchini exhibition was a great example of softness and the continuing fluidity in mix of dusty pink, pastel yellow and off-set geometrics, all adding to the cocooning type feeling prevailed. I had taken a similar emotional response to CC-Tapis, especially the rug designed by Patricia Urquiola with the comparable tonal colour composition and a hyper tactile surface. 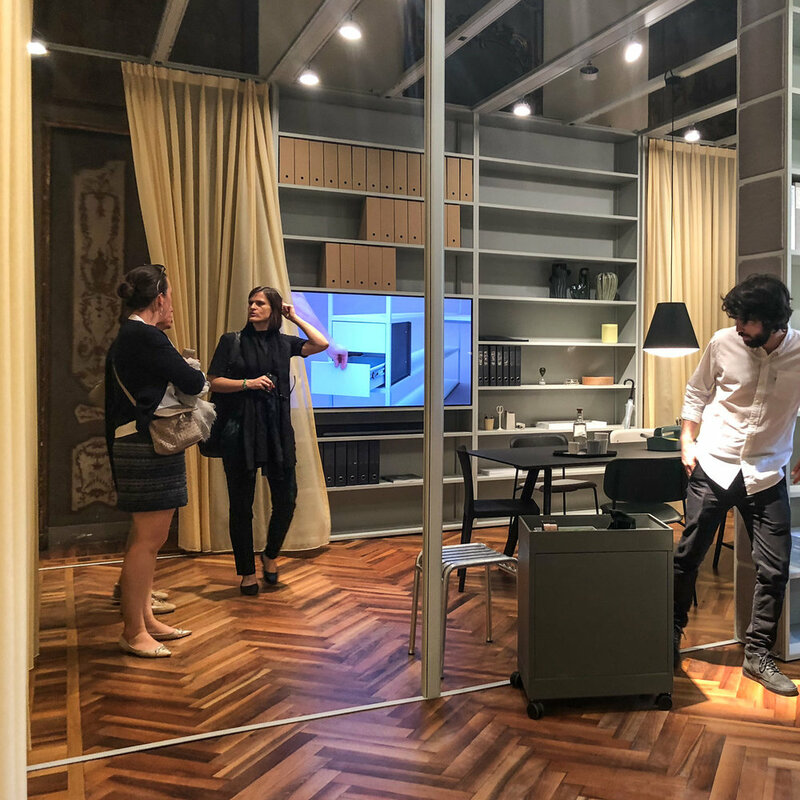 The integration of biophilia within products, exhibitions, and displays experience remained strong throughout Salone de Mobile and Fuorisalone, the recognition of the well-being benefits of biophilic design as reached a global scale, and the outlook being the trend is here to stay. 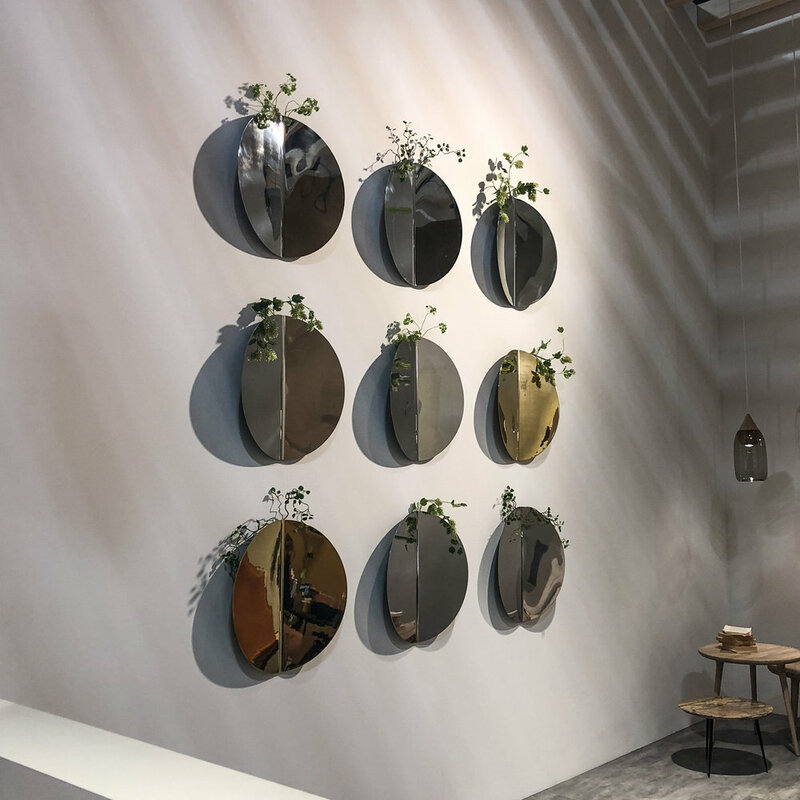 The miniforms collection plays with shape and form to provide a seamless stand to place your plants, whether be it on the wall, floor or reflecting against a mirror. A perfect opportunity to add height and interest to any environment. As well as nature, designers are looking up to the skies for inspiration as they explore the symbolism of the sun, moon, and space. This could be due to increasing cultural interest in spirituality, which can be seen to inform objects and settings to ignite people’s wonder and delight through magical and cosmic-like shapes. 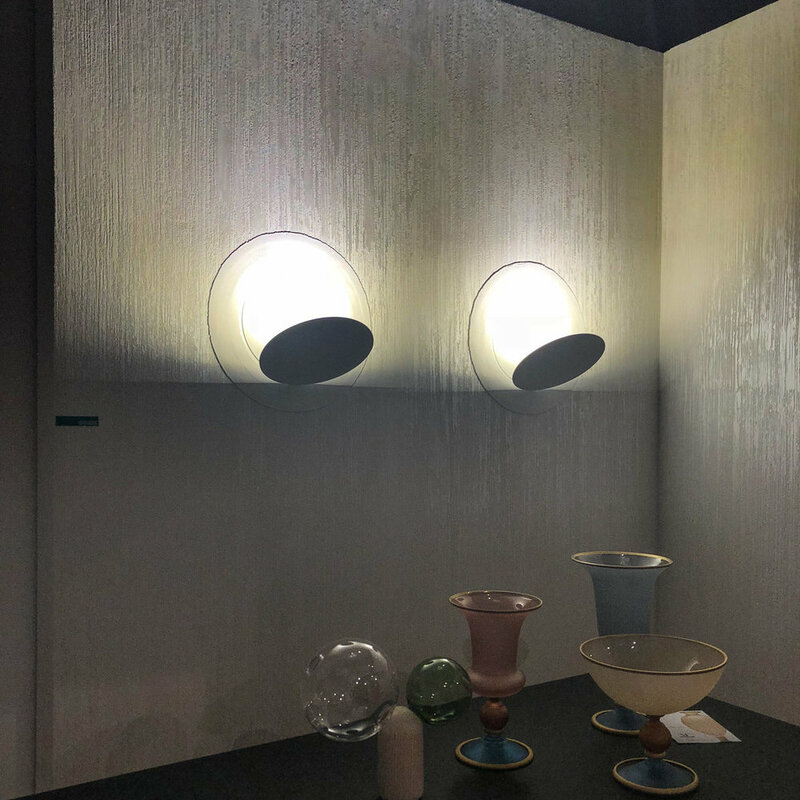 Equally, many exhibitions featured the use mismatching of materiality, furniture shapes, and products through styling, which also envelopes a similar unusual sense of awe due to the unexpected and uncanny (a.k.a the googly eyes). Milan took me through an unexpected and unimaginable journey, I didn’t know what to expect. With just over 48 hours in the city, I consumed an incredible amount of design, good food, some wine and walked around 40km. Even now it’s still taking some time to digest everything I saw and experienced.